This report, The Ibizan In Print & Online, is aimed at our contributors and advertisers. It may also be of interest to the ‘more committed’ of our regular readers and subscribers. It looks at the evolution of the newspaper’s digital presence, and details our plans going forward in print and online. Established in 1999 as The Ibiza Sun, the Island’s English language newspaper became The Ibizan in 2015. We don’t mind people still calling it The Ibiza Sun, many do and always will, but the reasons for a change are sound and probably obvious. Our aim remains the same today as it was in 1999 – to disseminate a broad cross-section of Ibiza’s news, views, events and activities, reflecting our equally broad cross-section of readers in the English-speaking community and our tourist visitors, throughout the whole of Ibiza and Formentera. To put it simply, we want everybody who picks up the newspaper to find some content to interest and entertain them. In reporting news and current affairs, our goal is to report objectively and impartially. In editorial it is to write honesty, and with the occasional helping of satire when due. We are aided in this through the co-operation and support of the Diario de Ibiza, who value our role in reaching the English-speaking community and tourist visitors, and kindly allow us to use their content if needed, and particularly their photography – allowing us to cover a far wider range of topics than we could hope to achieve alone. The Ibizan relies on our advertisers, without whom the newspaper would not be possible. We see the support of our advertising clients businesses as an integral part of the close relationship we have with them. We hope it seems as logical to our readers as it does to us, that content such as our popular food and drink section focuses in the main on those businesses that support the newspaper. Our role in supporting community initiatives and organisations is well established. From long-standing and regular contributors such as the English Speaking Church, to the many individual fundraising events, we are pleased to offer our platform wherever possible. We are also indebted to our team of community writers who help us extend the scope of our content greatly, in everything from sports to fashion to live music. In combining these three parts of our content, we hope to publish a reflection of the Ibiza known to the differing perspectives of our resident and visitor readers. Also to fulfill our own desire, and our commitment to our advertisers, to reach as many of them as possible. In essence little has changed in this objective over the years, but the available methods to achieve it certainly have – most notably with the ascent of online digital media. 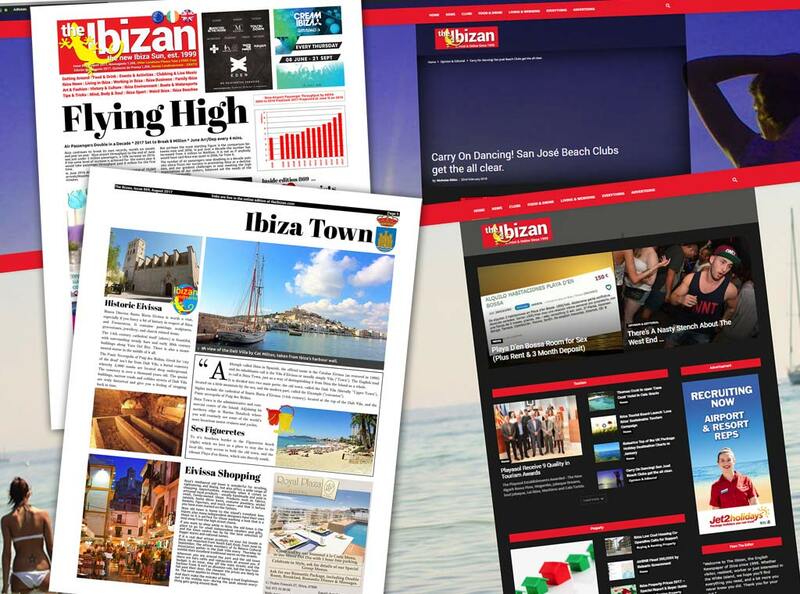 As with any newspaper, The Ibizan has to adapt to the changes in the way people access their media, and find a way that works for our readers, our advertisers, and The Ibizan as a business. The Ibizan, and Ibiza Sun before it, has never been profitable as a printed newspaper in the winter months. Publication between November and March has effectively been subsidised by the revenue from our summer advertisers. Historically the main difference between then and now is that back in the day there was no viable alternative to print. In the rapidly changing media world, it is sometimes easy to forget that facebook only launched on the world stage in 2005. It was another good few years before it and other social media started to gain the level of popularity and reach they now enjoy. One example of consequence for the Ibizan, and many other newspapers like us, is that the rise in social media put and end to classified advertising revenue. Financially the amounts involved are not huge, but it is an example that most will be able to relate to, that demonstrates why newspapers must adapt. If you wanted to buy or sell a second-hand car or a washing machine 10 years ago, the default source would have been the local newspaper. Now it is Facebook, and that is understandable as it offers an immediacy and interaction impossible for newspapers to offer. We certainly still advocate that classifieds are worth considering. I know for a fact that we sold a house last year – 50€ on an advert seems a bargain compared to a few thousand on agency fees. Also a 20,000€ boat with a delighted seller cancelling the advert after its first week of a booked five. But we are not that naive to think we can counter the overwhelming social change in the way people look to social media for this type of advertising service. In our case the classifieds and services page helped boost winter revenues to a reasonable level. That revenue has gone, and there is nothing to suggest it is likely to come back. There is no point us crying about that, it is simply a fact and we have to adapt. In the winter of 2016/2017 we experimented with a monthly paid edition of the printed newspaper alongside an increase in our digital distribution. This was successful to a level, but given what is by definition a limited maximum audience, it was unlikely to gain a level of profitability that would be equitable to the effort and cost of production and distribution. For the winter of 2017/2018 we decided to focus exclusively on development of the digital presence. This applies not only to the content itself, but also the way we publish, who we can reach, and how advertisers can continue to benefit in the absence of a printed newspaper. One advantage in digital publishing is that there is far more reliable information on the readership. The witchcraft of analytics reveals everything from how many different people access our content, how often they access it, how long they take and how many articles they read, and even what device they use and their location. (For the sake of clarity I should probably mention that this is all completely anonymous – we don’t know who you are, just how many). From an advertiser’s perspective it is also possible to see exactly how many people have seen their advert, and how many times people have clicked or tapped to find out more. This level of detail is unavailable in print, but importantly in the context of developing our digital publication it allows us to measure our reach against the printed newspaper. Notes: In combining data, we counted the number of physical editions printed and the number of unique website visitors. Technically the Ibiza Sun did have some website traffic, however the numbers were in the 100s and inconsequential to the statistics. The maximum number of printed copies during the winter months historically has been 5,000. 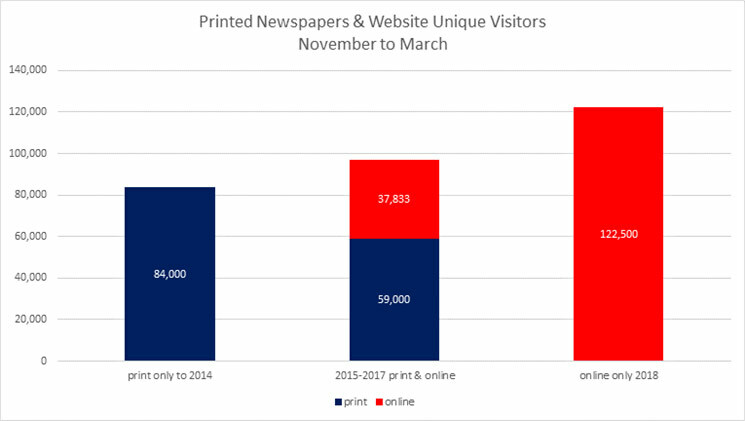 The graph shows the total printed copies from November to March ‘pre-digital’, the combined printed and online for the years from the launch of our new website in 2015 to 2017, and finally the number of ‘unique visitor’ readers in our first digital-only winter to March 2018. As can be seen, though it is via a different type of access, our readership reach is now greater than it has ever been. The number of actual articles read is much higher, with many of those readers viewing multiple articles – much as most print edition readers would pick those sections of the newspaper of interest to them. The graph refers to website activity only, but in reality our reach is far greater still, taking into account people who access our content via our various social media channels without following through to the website, (Think of all the articles you see in a Facebook timeline, that give you the gist of a subject that you do not necessarily click-through to read the full report). For advertisers the digital medium gives a particularly rosy picture. To compile figures we took the average of data from five of our long standing regular advertisers. 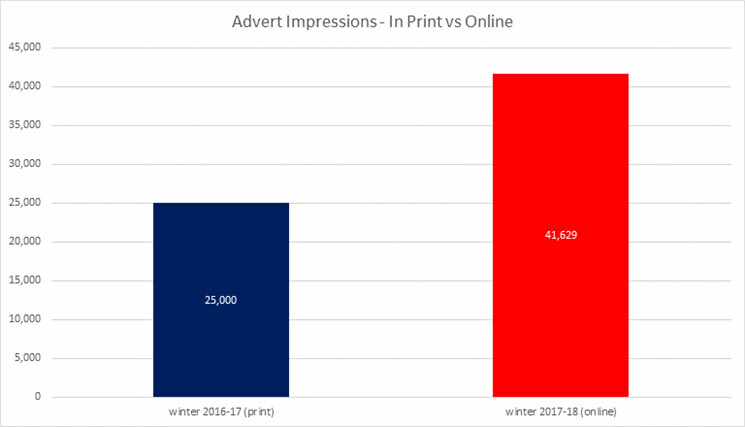 The first graph shows the total number of times a regular advertiser’s advert appeared in print compared to the number of digital impressions – which are only counted when the advert actually comes into view of the person reading the article. The reality if that more people than ever got to see our client’s adverts in 2018. The second graph shows the cost benefit in stark reality. 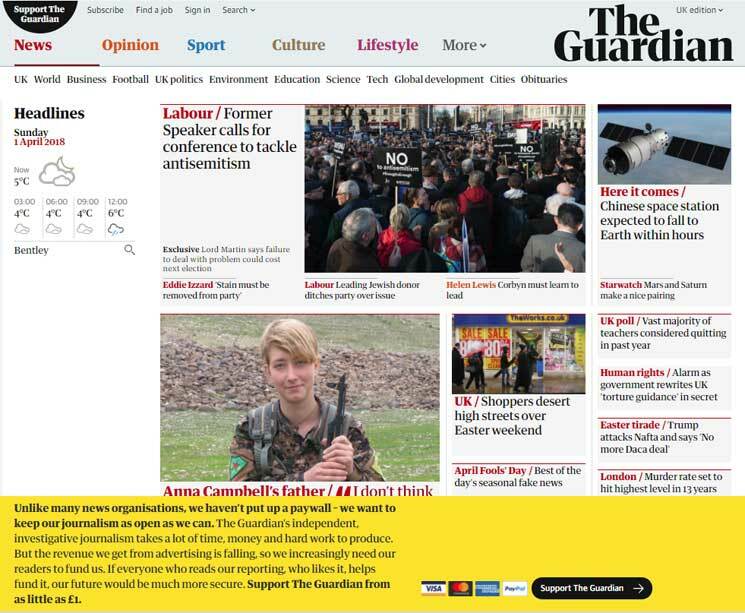 Even with the benefit of click-through links, the absence of the print production costs result in the same amount of advertising at a hugely reduced price – one-third the price to be precise. 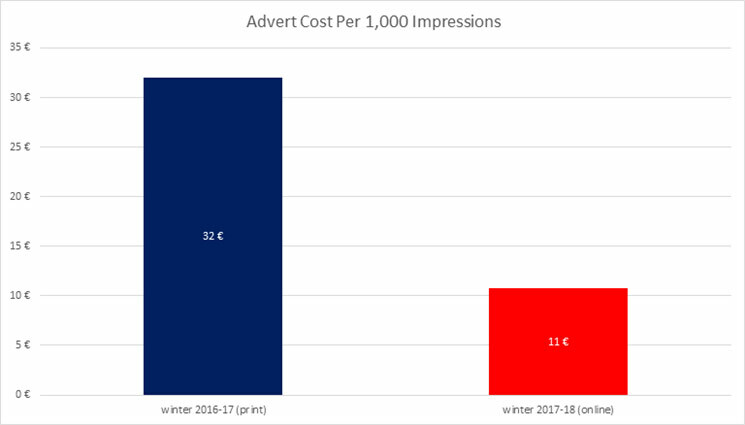 We hope that our winter advertisers will see that though online banner adverts are in a different and unfamiliar format, they need have no fears at reduced impact – and may ultimately find it a better bang for their buck. To put it very simply – more adverts, with additional features, for less money. Our subscriber base has grown significantly. Better yet is the ‘open’ rate of our subscriber list. We take some confidence from this that we are getting the right type of content out to our readers, and that our subscribers are ‘genuine’ – they have signed up because they want to receive our news, not because of some nagging obligation to add an email address to access our site. The Ibizan’s Breakfast Briefing subscriber service is achieving a 47% open rate, almost three times that of the media industry average of 17%, and a click rate of 27%, EIGHT TIMES the industry average of 3.5%. In a world with way too much junk email – we’re pretty proud of that! The subscriber service has a particularly high take up in the UK among Ibiza’s many annual seasonal returners, and frequently visiting tourists – people that could never access our content before the digital service. If Digital Is So Good, Why Print At All? We are still very much committed to publication of a printed newspaper in the summer months. First there is the simple matter of wanting to keep the format. Many of us do enjoy a newspaper, and given the number of apologies tendered for its winter loss, that might be higher than some think. Perhaps part of that is our Mediterranean cafe culture, the simple pleasure of a Café con Leche and a read of The Ibizan in the sunshine perhaps gives our paper the edge over the Doncaster Daily on a drizzly day. Secondly, and from our advertiser’s perspective of particular importance, the printed newspaper can reach the tourist parts of Ibiza that social media and other digital means still do not. We residents are connected to the most active Ibiza groups on Facebook, but our tourist visitors are not. They find the hotel reception counter copy of the newspaper as valuable as we hope they do interesting and enjoyable. Over the years we have refined our hotel distribution and now put the newspaper in those locations that display it prominently. The Ibizan is welcomed by the reception staff, who in many cases recommend it and actively distribute it, to the hotel guests. Toward the end of 2017 we decided to develop that principal and issued special monthly tourist editions. These were double sized 36 page editions with an increased print run, and featured pages dedicated to the various centres of the island, whilst still retaining our regular news, agenda and community etc content. The monthly tourist editions were a great success, and resulted in the highly unusual situation in the newspaper world of ending with zero unused returns. In fulfilling our dual objectives of reaching the readers our advertisers want, and also our own of reaching both visitors and residents, we will continue this monthly bumper tourist edition for the 2018 season. We distribute the monthly tourist edition to hotels, with enough copies for the the month, plus all of our usual points, supermarkets, bars etc. The weekly edition in the intervening weeks will continue in the established familiar format, and goes to all of our usual distribution points, but not the hotels. Though the focus of this report was to look at the consequences of the ‘digital only’ winter, it is actually our online presence in summer that gives us the greatest cause for celebration. In August 2017 our monthly unique website visitors reached just short of 100,000 – an incredible result that reflects substantial year on year growth. Now with the benefit of the tools we have put in place over the winter months, we can offer our advertisers the opportunity to reach our readers with a combination of traditional print, and new digital banner advertising. In print our advertisers will reap the benefits of our focused 36 page tourist editions with extended distribution to hotel and apartment guests. placement by content – and select advert placement by the type of content, so further refining the positioning of their advertising to achieve maximum return for their investment. device optimisation – We optimise our digital banner adverts for the device type of the reader. On desktop and laptop we serve effective animated banners which gain maximum attention. On mobile the emphasis is on speed and so we drop animation in favour of a good user experience. We appreciate that the benefits of change must be substantiated, and it may take some time to gain acceptance. With this in mind we did not make a song and dance about what we were doing for winter in advance. We felt it better to work the winter and then be able to produce real evidence of what we had achieved. Any advertising client, new or existing, can now see real figures to back up our claims – and as part of the service can opt for their own login account where they can monitor their advert performance directly. Advertising is available for just print, just digital, or combining the best of both with some great package deals.